When I think of Vienna, I think of Gustav Klimt and Art Nouveau artists. This summer, I visited Vienna, admired its palaces and magnificent 19th Century buildings and of course I went to see some famous Art Nouveau spots. 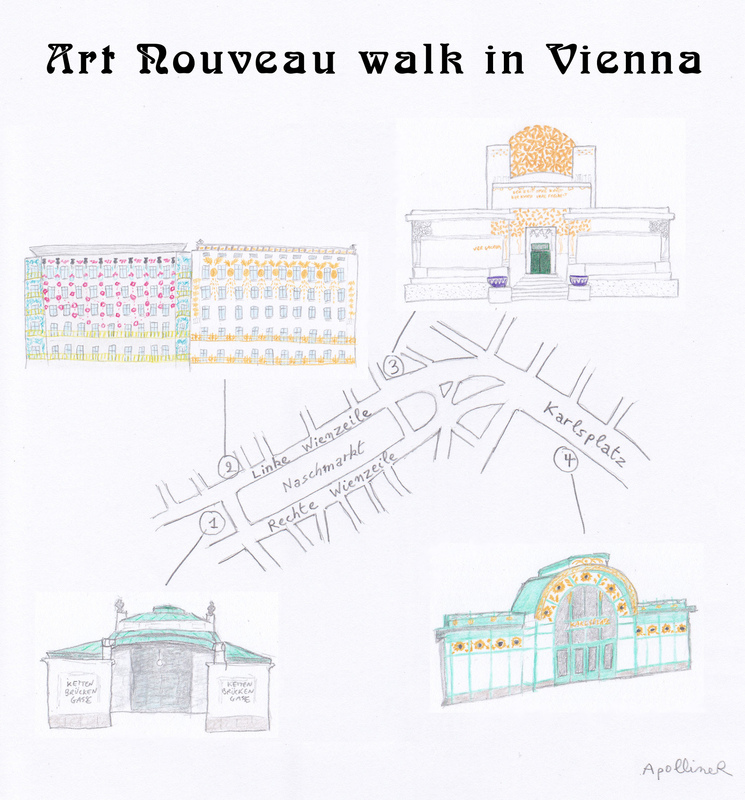 Are you ready for a Art Nouveau walk in Vienna with me? The walk starts at Kettenbrückengasse subway station (on the U4 line). And the first Art Nouveau site is the subway station itself. It was built in 1899 by architect Otto Wagner, who designed other stations on the U4 line. Otto Wagner can be compared to Hector Guimard who built Paris subway stations. However Kettenbrückengasse subway station is more sober than Guimard’s luxuriant subway stations in Paris. We can find foliage patterns that are typical of Art Nouveau style: indeed Art Nouveau artists wanted to reintroduce Nature into Art. The second stop is not far: located Linke Wienzeile 38 and 40, next to the subway station, Majolica House and Medallion House buildings were built by Otto Wagner in 1899. Majolica House or Majolikahaus is covered with pink flower ceramic tiles. That makes a change from facades that are all the same color! Medallion House is decorated with golden palm leaves, garlands and medallions of women’s heads by Kolo Moser. Art Nouveau artists thought that Architecture or Wrought-iron Work were Art in the same way as Painting or Sculpture. For them, there were no major arts or minor arts. All the forms of Art were valuable and collaborated for a total art. Medallion House. Detail of the balconies. Then we take Linke Wienzeile and go along Naschmarkt market. After 600 meters, we arrive at a building topped with a golden openwork dome. In Austria, instead of Art Nouveau, people use the expressions Jugendstil or Vienna Secession. Originally, a group of artists decided to secede from Vienna conservatist artists. They needed a place to exhibit. So in 1898, architect Joseph Olbrich designed this building which is called… Secession of course! The building includes many symbols, as if there were a coded message in the architecture. For example, gorgon heads (a gorgon is a woman with snakes instead of hair) and owls are attributes of Athena, goddess of wisdom in Greek mythology. And laurel is associated with Apollo, god of the arts. However I don’t know what those small turtles strolling under a big mosaic pot symbolise. We walk on the same street until Karlsplatz where there are two former subway stations by Otto Wagner facing each other. The facade is in white marble and ornamented with stylized sunflowers. The walk stops at Karlsplatz where you can enjoy Resselpark and have a break under the trees. In Paris I like when I go through a Metro entrance designed by architect Hector Guimard. I admire its steel lace and the organic curves of the street lights that lean over passers-by. I appreciate that a work of art is on the street, accessible to everyone. And I take my dose of Art Nouveau before following my route. This is a genuine Guimard metro entrance but it is not in Paris. The answer is in the comment section. The metro entrances are typical part of Paris street furniture (like Wallace fountains). 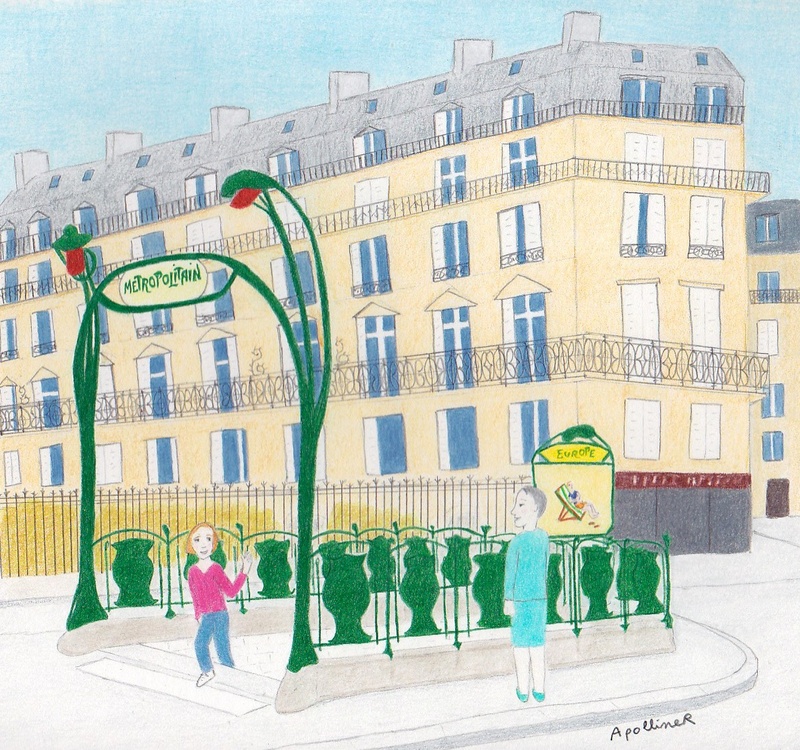 In 1899, the Compagnie du Métropolitain de Paris asks Hector Guimard to design different entrances to the metro : small stations, enclosed entrances (called “édicules”) and open entrances (called “entourages”). Hector Guimard is an architect who belongs to the Art Nouveau movement. His cast iron gates indicate the entrances to the new Paris metro. They are criticized for their innovating shapes. After Guimard, metro entrances are less avant-garde. Open entrances are made of stone or wrought iron. Entrances are signposted by masts. Later, they are replaced by signs simply saying “metro” or “M” (those signs are not worth taking a picture of) to signpost the stairs (only stairs no lift, Paris metro is not wheelchair-accessible). In 2000 at last, a new metro entrance is bold. The “kiosque des noctambules” (kiosk of the night-birds) is designed by the French artist Jean-Michel Othoniel for the Palais Royal station. I like this kiosk surmounted by two domes made of glass bubbles because it’s kitsch and fairy. The criticism I would make of this work of art is that it doesn’t help you to find the metro entrance because there is no sign. I am afraid it has forgotten its main function. I visited the Musée des arts décoratifs in Paris during Heritage Days. The surroundings are nice and look like the Louvre Museum (it is normal because the museum is in a wing of the Louvre Palace). The museum is a maze of corridors and I had to ask several times how to get to my destination. Decorative Arts, it is when daily objects become works of art. The museum presents some furniture, chests, chairs, tableware, jewellery etc. I liked the period rooms: there are for example a Renaissance bedroom, an 18th Century living room and the apartment of the fashion designer Jeanne Lanvin. I was only disappointed with the Jean-Paul Gautier exhibition in the Fashion department. I found that the clothes were a little worn. Some restorers were present on the occasion of Heritage Days. A tapestry-maker explained how he repaired old tapestries. I heard that the wall hangings in the Jeanne Lanvin’s apartment were restored in India. I didn’t know that offshoring concerned culture too 🙁 . A magnificent eighteenth century canapé. The style of this sofa is called Louis Quinze. I was not allowed to sit on it but it looks comfortable and is very long. An Art Nouveau guéridon designed and manufactured by the furniture designer Louis Majorelle around 1902. The top is in the form of a water lily leaf. And a tea set made around 1785. With this furniture I could furnish a living room to my liking.